This week for writing, we started to prepare for creating a persuasive speech with the topic of our choice. 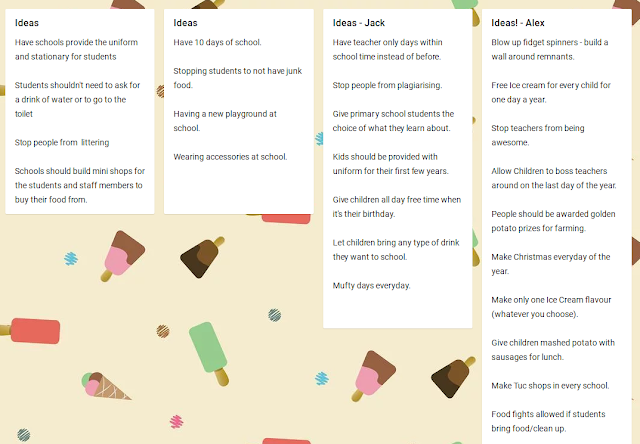 We had to things to do for this weeks work, as a group come up with ideas to write a speech about, and to plan out three of them into a speech. For my ideas, I came up with topics that would effect on me, and my ideas were about what things should change in school. My three topics I chose, was teacher only days being within our time at school, to stop people from plagiarising work, and giving children that have their birthdays on a school day, all day free time. We were all given a template that we would work on, but my plans, they're more like the real speech itself. The reason why I'd done this was to give myself an idea of what I would write when we need to write the actual speech it self. My topic: Teacher Only Days. My argument: Why they should be within school time instead of before. Everyone can’t wait for the weekend, right? Wouldn’t you love it if at random times you didn’t have to go to school? Well that’s why I think that our teacher only days should be within our school year instead of before it starts. Have you ever thought about this, and disagreed with how our school uses it? Teacher only days, people think that’s it’s the day that they’ve been blessed, and I agree with that. If people don’t want to be at school, and it’s a teacher only day, children would probably have the time of their life. That’s why teacher only days should be within our time we have at school. You’ll be able to spend more time with your family. Kids can continue work they need to finish before the end of the week. If we can have our teacher only days like this, then children won't say that school is like a PRISON. Also, to the teachers, you wouldn’t have to deal with us as much as you have to. Can I have a raise of hand to the people that can get bored sometimes at school. Well you don’t have to feel that way if this changed. Children can go home, teachers can talk, etc. Plus teachers can have more time to plan their lessons for the next day of learning. My argument: Why people shouldn’t plagiarise. Plagiarism, when you hear that word, what do you think of? Is it a disease, is it the newest piece of technology that I haven’t bought yet? No, it’s even worse. Have you ever heard of this terrific word? I think that no one should ever plagiarise. It’s one of the worse think you could do, well, that’s a bit of an exaggeration. Plagiarism means taking the work or credit away from the owner, without consent of ownership, or without consent of showing it off, but still giving credit to the rightful owner. Plagiarism can come with many consequences that not many people want. Stop plagiarising, or never start it. Plagiarism is very dangerous, and if you ever plagiarise, you’ll have pay the price. My topic: All day free time on your birthday. My argument: That children that have their birthday on a school day should be allowed to have free time the entire day. Don’t you love it when sometimes at the end of the day, you hear your teacher say “Alright, you guys can have free time for the rest of the day.” Of course you do, because even if you don’t wanna play games, you can continue with your work. Although, what do you like more. Free time, or having your birthday on a school day? Well, what if you could have both of them at the same time. I think that if it’s your birthday, and it’s also a school day. You should be able to have free time for the WHOLE DAY! It’s better to have your birthday on a weekend or holiday instead of at school. The reason why, you can play all the games you like, you can spend time with your family, and go and have McDonalds for breakfast, lunch, and dinner! If your birthday is on a school day, you’d mostly just be told the two words, Happy Birthday, and then be sang to by the class. Lot’s of people enjoy just an hour of free time, but imagine the amazing things that’ll happen. Give children that have their birthdays on a school day something to enjoy. It’s important to feel special when it’s your birthday, so if you can have free time all day long, then children have fun on their day they’re representing when they were first alive. It seems that you had some fun while making these plans. I also like your topics because they're really well thought of. I have a few questions though, Was it easy to think of those ideas? And did it take long for you to decide on your three? Great job on doing this!